Tapping mode is a type of an amplitude modulation (AM) technique, in which large-amplitude vibrations of the probe are applied for imaging. It allows for measurements to be made at ambient conditions. When the oscillating probe hits the sample, its short-time interactions with minimal shear are less destructive than the tip-sample forces in contact mode. Fig. 1. Tapping mode topography image of self-assembled structures of semifluorinated alkanes on Si (Agilent 5500 AFM, General Purpose probe). Scan size 350 x 350 nm. Scan height 5 nm. 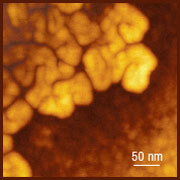 Image courtesy of S. Magonov, Agilent Technologies. For identifying a type of tip-sample force, e.g. attractive or repulsive, recording of the phase behavior of the AFM probe (for example, as phase shift dependence on tip-sample separation) can be used. Actually, at small amplitudes the operation in tapping mode is characterized by attractive tip-sample forces and overlaps with the operation in noncontact mode. The latter mode is characterized by small probe oscillations and net attractive interactions which does not necessary mean true noncontact regime. Stable oscillations of the tapping probe are possible when the probe has enough energy to overcome the adhesive and capillary forces of the samples in air. Traditionally, Si probes with stiffness in the 30 - 50 N/m, such as the HQ:NSC15, are used for tapping mode experiments. Depending on the type of the sample and problem to solve, probes with stiffness ranging from 0.3 N/m to 400 N/m may be required. Probes with low stiffness should be applied to soft materials or particles with low adhesion to the surface. Stiff probes are used for imaging at the elevated forces needed for the visualization of mechanically-different components of multicomponent samples. The stiffness of the probe is only one of the parameters that influence tip-sample forces in tapping mode. The other parameters are two amplitudes: the amplitude of the free oscillating probe and the set-point amplitude used for the feedback. The difference between the set-point and free amplitude determines the tip-sample force level, which controls the image contrast. Between two cantilevers with a given spring constant, the one with the higher resonance frequency is preferable because it allows for a faster scan rate. Cantilevers with a high resonance frequency of 300 kHz and above provide the fastest possible scan rates. It should also be taken into account that polymer surfaces become stiffer at higher frequencies. This property further reduces the possibility of sample damage when using a high resonance frequency cantilever. High Q-factor is desirable in tapping mode to optimize the sensitivity. For a given resonance frequency and spring constant, a rectangular cantilever generally has the higher Q-factor in comparison to its triangular analog. Important: If an AFM study involves heating the probe, Si cantilevers without any coating are preferred. Coated cantilevers can bend and/or twist at elevated temperatures. Hi'Res-C tips provide extremely high resolution when used in light tapping mode on smooth surfaces. See the application note on high resolution imaging for details. If a particular sample seems to be having problems with adhesive capillary tip-sample forces, these forces can be substantially reduced by immersing the tip and the sample in a liquid, which generally requires the use of a liquid cell accessory. Further reduction of the attractive forces is possible by operating in appropriate solvents, especially ethanol. The liquid cell is also used for in-situ electrochemical and biological experiments. Conventional liquid cells have a drive frequency of about 10 kHz. This matches the resonance frequency of cantilevers that vibrate in air at about 50 - 70 kHz. Typical values of the Q-factor in liquids are 1 - 3 due to increased hydrodynamic damping. Rectangular cantilevers suffer less damping in liquids than triangular cantilevers. Important: Al reflective coating is usually stable in water and ethanol. However, certain experimental conditions may cause corrosion of the coating. For example, Al dissolves readily in caustic alkali solutions to give Al hydroxide. It's generally recommended to use uncoated cantilevers or cantilevers with Cr-Au backside coating in liquids.